Four years ago we moved from Eastbourne to Middlewich in Cheshire. Some of our packed boxes got put into the loft and have been there ever since. This weekend we have discovered a box of original Technics production disks. We have found software for KN keyboards and organs going back as far as the KN750 & KN1000, the EN4, EN6 & GA organs, this also included some previous never commercially released styles. We even found an old SMAC 1200 in the same box. So what does this mean? To cut a long story short, we will now be able to support these fabulous (if a little old) instruments again. We believe we will be the only music software company in the world left to be doing so. We are certainly the only business to be releasing new Technics software, as Single styles comes to Technics keyboards (see here). For those not aware John Romero, who wrote almost all of our Technics software, was one of the three founder writers that started the Technics User Club back in the 90's and it was this that led to the start of Carillon Studios. We have now re-released 6 Technics organ disks which you will find the disks after checking all of them you will find them under our Technics Organ Software section. We have now launched three styles that have never been commercially available before for KN3000 and onward keyboards. 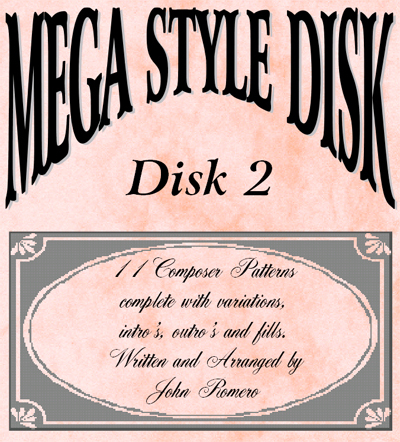 These are downloadable and go under the heading of Mega Single Styles. We are going to add to this collection over the next days and weeks!